Ultraflex Systems is the only source you need for grand format banner media. We are proudly recognized as the innovative leader in the digital media industry. As we have done for the past 25 years, we introduce new products to the market every year. From outdoor banner material to floor graphics media, all PVC and specialty substrates available from Ultraflex Systems meet superior manufacturing standards and are warrantied. We have more than 100,000 rolls of inventory in our warehouses, and our logistics experts are able to handle product shipments to global clients quickly and efficiently. 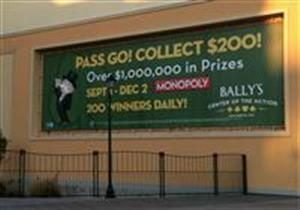 The product lines from Ultraflex systems feature media that is perfect for banner and billboard applications. Media in our Mesh Banner Material Line and Front-lit, Back-lit and Blockout Media lines are typically compatible with eco-solvent, solvent, UV, Latex and/or screen printing equipment, and our Vortex D and Vortex T Lines feature soft signage fabrics that are specifically designed for use on UV, latex, dye transfer and/or dye sublimation equipment. We also offer Reach Compliant floor graphics and grand format banner media including our Ultralon IV back-lit banner material, Floorscapes printable flooring media, Ultrapoplin Soft Image D240 and more. Perfect for nearly every type of wide-format and grand format printing equipment, all products at Ultraflex Systems can be used worldwide for banner, billboard, floor graphic and other applications and are usually available in several widths ranging from 36” to 196”. Contact an Ultraflex media specialist today for more information or to request a floor graphics or other media sample.